What is all the hoopla about heartworm? Home » What is all the hoopla about heartworm? The days are getting warmer! This means mosquitoes are out too and it’s time to protect our pets against heartworm. All it takes is one infected mosquito to bite your pet which then injects microfilariae or “baby worms” into your pet’s bloodstream. They then find their way to the right side of the heart and reproduce quickly which can block blood flow to the rest of your pet’s body – this can be fatal if not treated. 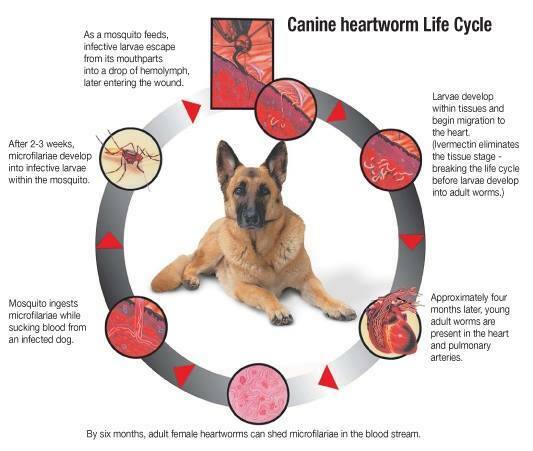 Heartworm cannot be passed from dog to dog or cat to cat because of direct contact with each other but a mosquito can bite an infected pet and pass it to the next pet they bite. We can catch heartworm this way too, but our symptoms are less severe – the larvae can create cysts in our eyes and lungs. 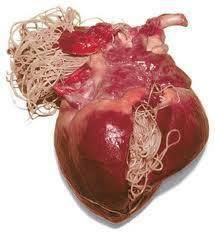 If you notice your pet exhibiting any symptoms, take them to your veterinarian where they can test for heartworm. Remember – prevention is best! Don’t forget to start June1st if you are not on year round prevention.